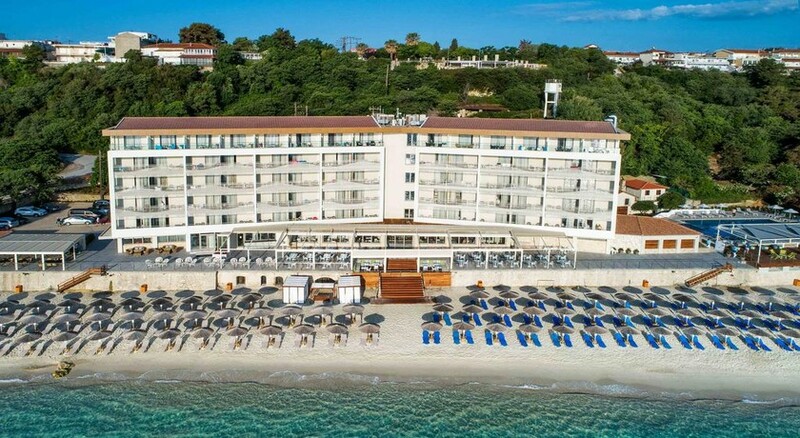 Ammon Zeus is a 4 star hotel situated in the area of Kallithea, Chalkidiki. The beach on which Ammon Zeus was built, is one of the cleanest in Chalkidiki and is awarded with a Blue Flag of the European Union. The endless, well-organized beach, covered with fine sand, is next to the hotel. 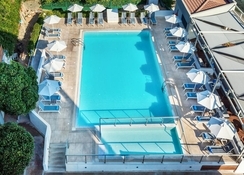 Ammon Zeus Hotel allocates 126 rooms, 114 of them are double rooms and 12 are family rooms, all fully renovated in 2002, equipped with refrigerator, air condition, TV and hair dryer. The Airport is located 85 km from the hotel. 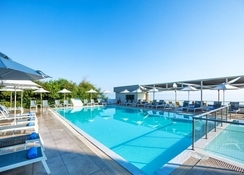 Water sports are provided nearby by local providers Please note that the use of Hamam, Sauna, Mini gym, Jacuzzi, Internet Corner,Sunbeds and umbrellas at the beach is subject to charge. From the airport of Thessaloniki follow the signs to Moudania. Following theses signs there is the national road to Halkidiki. Following this road - and passing through the towns of Nea Moudania, Nea Potidea, Nea Fokea and Afitos - will lead directly to Kallithea. The hotel offers a 24hrs check-in service as well as a free parking area for the guests.